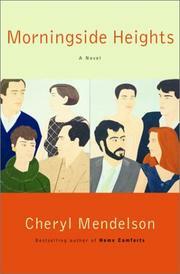 A first novel by Mendelson (Home Comforts, not reviewed) follows the intersecting fortunes of a group of friends and neighbors who live in an enclave of Manhattan’s Upper West Side. Morningside Heights is one of those pleasant, dull neighborhoods that used to be common in New York. Built largely as a preserve for the well-to-do, it began a long decline during the Depression and for many decades muddled along with a kind of seedy sophistication that was typical in the pre-Guiliani era. When Anne and Charles Braithwaite moved to the Heights in the early ’80s it was a great place to live: adjacent to Columbia University, inexpensive but richly endowed with good schools, bookstores, churches, and parks. Charles was a singer at the Metropolitan Opera, Anne a concert pianist who had stopped performing to devote herself to their three children. By the late ’90s, however, soaring real estate prices had changed the character of the place as families and retirees could no longer afford the rents. When Anne discovers she’s pregnant again, she and Charles reluctantly decide to look for a bigger place in the suburbs—but just then they learn that Anne has been named primary beneficiary in the will of the late Elizabeth Miller, who had lived across the hall from them. Elizabeth, 103 when she died, had never married and for more than 20 years had placed all her business affairs in the hands of Eugene Becker, a shady lawyer who claims that Elizabeth was essentially bankrupt and that at any rate she had made a later will in his favor. Anne and Charles are willing to let the matter pass, but they can’t help wondering: If Elizabeth was truly broke, why did Becker go to the bother of drawing up a new will for her? Thoroughly likable debut fiction (the first of a trilogy), narrated in an old-fashioned leisurely style with enough subplots, mysteries, and denouements to keep any reader engaged for the duration.